Chocolate Burfi is perfect for kids made using milk powder. 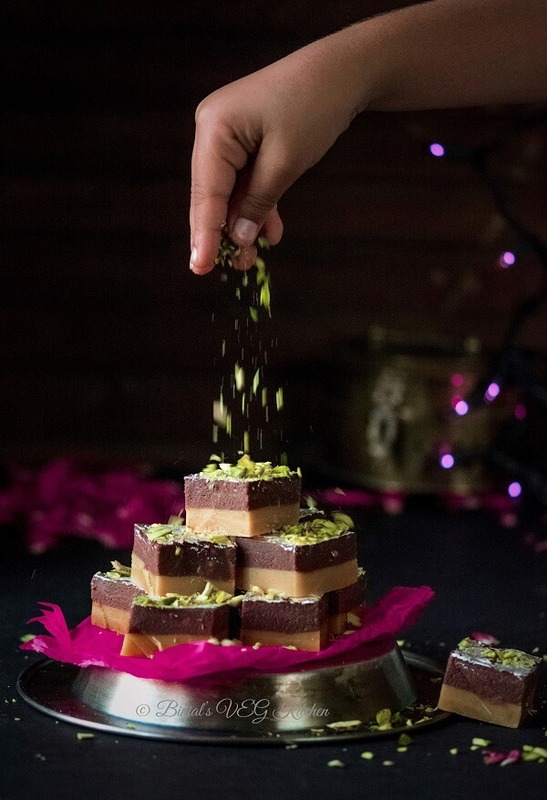 Chocolate Burfi is quick and easy to make for any festival. Chocolate Burfi is two layered burfi recipe, bottom layer is plain white burfi while the top layer is cocoa flavored chocolate burfi. 1. Take a wide pan, add ghee, milk, milk powder and stir it few minutes till mix well. 2. Add powder sugar, cardamom powder and mix well, stir it continuously till mixture becomes thick, it will take 7-8 minutes on low to medium flame. 3. Grease a plate with few drops of ghee, pour the mixture and spread it evenly using a spoon or the small flat bottom bowl, apply little ghee on it and spread it to avoid sticking the mixture. Keep aside for cool down. 1. In the same pan, add ghee, milk, milk powder and stir it till mix well. 2. Add powder sugar and mix well, stir it till it becomes thick mixture or 5-6 minutes. 3. Add cocoa powder and mix well, again stir it till smooth texture. 4. Now pour the prepared mixture over the white layer, spread it evenly, again use spoon or small bowl applying with little ghee, make smooth and flat surface. 5. Let it be cool down for 2-3 hour, after one hour you can place the plate into the freeze for quick cooling for ½ hour. 6. 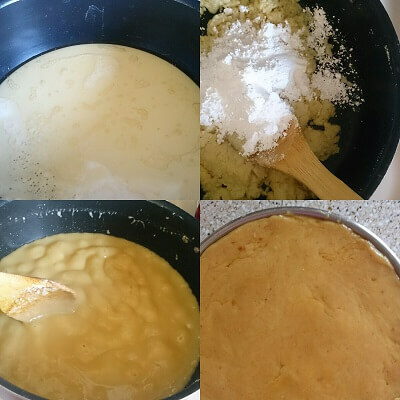 Now the mixture becomes hard, cut into desire or diagonal or square shape, as per your choice. Chocolate Burfi is ready. You can apply edible silver leaf/chandi warq and garnish it with chopped pistachios. • You can use mawa/khoya instead of milk powder and milk. • Add sugar level as per you choice. • Always cook it on low to medium flame. Take a wide pan, add ghee, milk, milk powder and stir it few minutes till mix well. Add powder sugar, cardamom powder and mix well, stir it continuously till mixture becomes thick, it will take 7-8 minutes on low to medium flame. In the same pan, add ghee, milk, milk powder and stir it till mix well. Add powder sugar and mix well, stir it till it becomes thick mixture or 5-6 minutes. Add cocoa powder and mix well, again stir it till smooth texture. Now pour the prepared mixture over the white layer, spread it evenly, again use spoon or small bowl applying with little ghee, make smooth and flat surface. Let it be cool down for 2-3 hour, after one hour you can place the plate into the freeze for quick cooling for ½ hour. 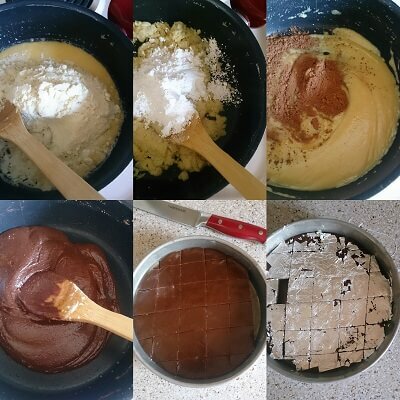 Now the mixture becomes hard, cut into desire or diagonal or square shape, as per your choice. Hi there! Can I substitute the powdered sugar with condenaed milk? Thank you for sharing such a hreat recipe. Tried the recipe as per the steps, but the barfi turned out chewy to eat. I think you cooked the mixture little bit more! that’s the main reason it becomes chewy! How long will this barfi store and can I keep it in the fridge? 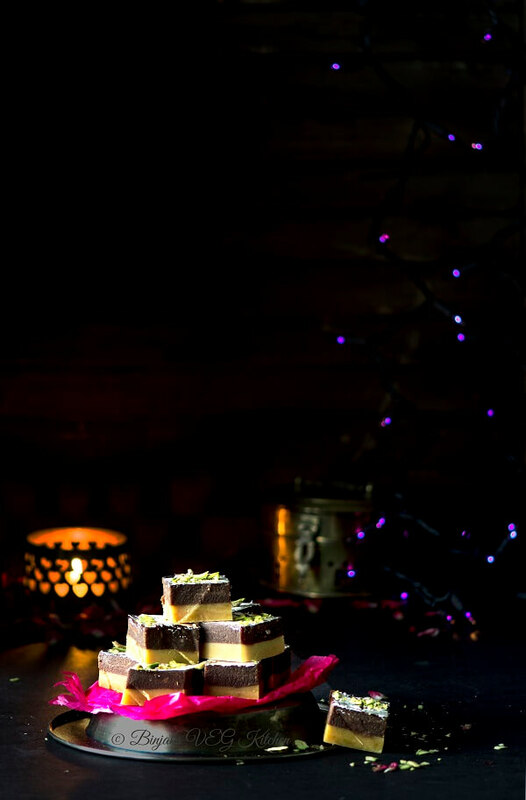 yummylicious chocolate burfi.. brilliant shots as ever..
OMG! Binjal… These look so professional. I am going to give a try very soon. Give me a handshake. Sowmya recently posted…AMLA GINGER LEMON DETOX – For a happy-healthy tummy! Hi dear. 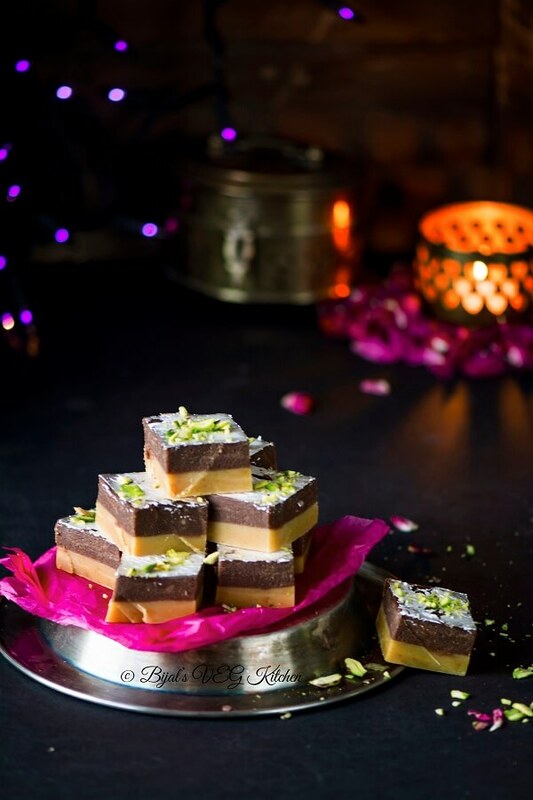 The barfi looks very tempting and easy to make for someone like me 🙂 I have only one query, can I use whole sugar instead of powder one? Hi, did you use Non fat milk powder ( seems like that is the only kind available in stores). Also which cocoa powder did you use? Thanks. I used Deep brand mawa milk powder, you can use nido nestle, amul, which is easily available in any Indian grocery stores, and for cocoa powder i used Hershey cocoa powder. As always super looking !! If the milk powder is replaced with khoya, how much khoya should be added? Thanks! use 1 cup finely grated Khoya instead of 1 1/2 cup milk powder!